Four Corners today announced the pending release of three of their All Day Ales™ in cans, which will be available beginning Friday, March 21. It's a first for the brewery, in that they'll now have their beer at retail accounts, while the choice of packaging represents a first for Texans. According to the press release, "Four Corners 'uncanny' beer cans will be the first in Texas to feature the Crown Holding, Inc. 360 End™ lid, a removable lid that turns the can into a drinking vessel. The fully open top gives the drinker a similar experience to drinking out of a glass. In fact, the lid eliminates the need for glassware, making the can even more appealing for outdoor activities. To top it off, the cans are manufactured in a Texas production facility, keeping virtually all of Four Corners' can production local." Commenting on the news, co-founder and director of business development George Esquivel said, "As a Texas brewery, packaging our beer in can format simply makes sense. We (Texans) spend our leisure time by the lake, river or pool (and barbecue pits, of course) and our brews are intended to be part of that enjoyment. The quality of our beer is well-protected, and with the removable lid, drinkers will enjoy the aroma and full flavor of our brews. Great beer brings people together, and we're thrilled to have the opportunity to share out beer with the world." 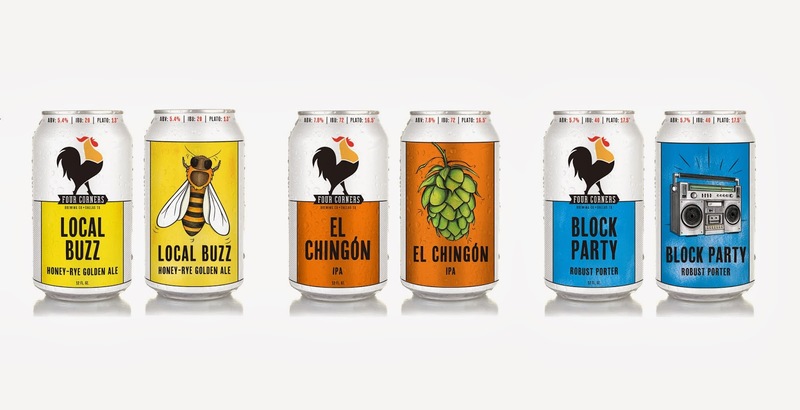 Look for Local Buzz, El Chingón IPA and Block Party Porter at the following retailers: North Oak Cliff Beer & Wine, Bolsa Mercado, Lonestar Beverages, Parkit Market, Central Market, Whole Foods, Kroger, Spec's, Total Wine, H-E-B and Walgreens. Suggested retail price of six-packs will be $8.99-$9.99 (pricing varies by retailer).